It's not the telescope nor the stuffed crocodile in front of him. My son may look like a big boy now but he can never sleep without his Elmo. He had that pillow ever since he was two years old. He takes Elmo wherever he sleeps, be it in our bedroom or during our out of town trips. That's how special Elmo is to him. What's your child's favorite? Share it with us on Mommy Moments. That should remind you that you still have a little boy... ang cute naman. Happy weekend! 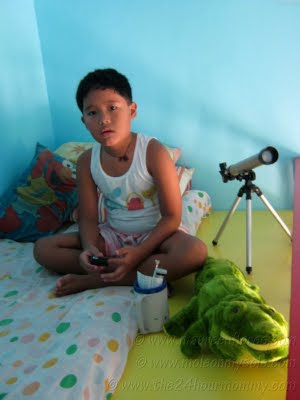 What a cute astronomer in the making..
wow maybe he wants to be a scientist but its ok if still sleep with elmo hehehhe. Happy MM! he looks cute and contemplative on his corner with his favorites. happy mommy moments! I really want to research this attachment to stuffed toys in kids. Will share it with you, once I've done it. :) You have a good-looking son there! oh, elmo must be very special.. happy MM day! i think at some point, kids talaga gets attached to a certain toy/character. My baby din can't sleep without her winnie the pooh doll- and perhaps hanggang paglaki rin niya she'll take with her the fondness to that thing. pareho pala sila ng anak ko dati pero ngayon di na niya hinahanap ang mga stuff toys sa pagtulog altho he still plays with some of them. He's still your baby kahit malaki na sya. My son who is three years old keeps reminding me when I call him baby that he's now a big boy. Haha! Thanks for sharing your son's favorite here.